Kalley Huddleston is one of The Industry founders, a writers' workroom and filmmaking group in Grady. Editor’s Note: #GradyGrit is a series of profiles of Grady College students who show determination, leadership and outreach to the community. 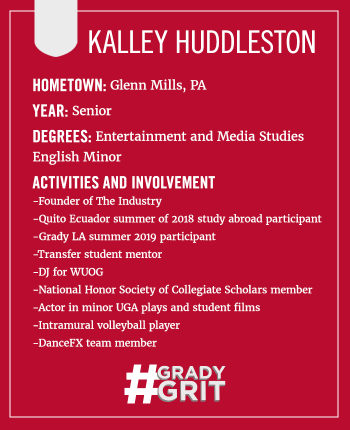 Visit our #GradyGrit webpage for additional profiles. What does having “Grady Grit” mean to you? Being a Grady Grit means the WORLD to me. I have dyslexia so school has always been a struggle for me so it is just such an honor seeing all my hard work pay off. It is just another reminder that if you keep your eye on the prize you can touch the sky! What is the best part about being an EMST major? The best part about being an EMST major is the friendships! I am a transfer student to UGA, so I never really got to meet my “crew” by living in the freshman dorms, eating at the dining halls, having the freshman odyssey class, ect. But as an EMST major I met 60+ amazing, wonderfully talented, smart, caring and fun individuals right away. You grow so close to the people in your cohort and that is something I will forever be grateful for. What is the hardest part about being an EMST major? The hardest part about being an EMST major is not comparing yourself to others. EMST is great because you are always being encouraged to push yourself, but it is hard not to discouraged by people saying, “Well I have already made five short films that have won contests and film festivals. What have you done? !” You have to keep reminding yourself that this is school and we are all here for one reason: to learn! So there really is no point in talking about what you have done it is all about what you will do! How do you think Grady celebrates diversity? Grady is always celebrating diversity by allowing the students to share their stories. Whether it is a film, journalism, artwork, makeup, tattoos, piercings, music, costumes, ect, there is no limit! I also really appreciate the women in Grady. The Women In Media Club, the women who are professors and have their doctorate, they are a strong, fearless bunch and they inspire me every day. In five years, I see myself working at a production company writing for television or movies! I would hope to be in a writer’s room at that point and get to collaborate and write stories with amazing people every day. I would be happy living in either Los Angeles, New York, or Atlanta with a cat. How did you get involved with creating The Industry? What have you learned from it? I came up with the idea of creating The Industry after my Intro to Productions class. I did audio for our final project and it was great, I totally loved it, but I felt that I had become “the sound girl”. I love working with sound and I want to continue to do so in the future, but I wanted to learn how to direct, write and produce. It is hard getting your hands on a new job when you don’t have any past experiences, so I wanted to create a safe space for students to try new things with no consequences. At The Industry, there is no limit on what you can and cannot do. From creating The Industry, I have learned that teamwork is everything. Having a team of people you can trust and work well with is everything. I am so thankful to have such a wonderful team (Julian Hagins, Gillian Revoir, Anne Neenan, Trey Leonar, Rachel Gomez and our advisor Dr. Hamilton) to help me every step of the way. Without them, The Industry would not be where it is today. I’ve also learned it is important to stay organized and stick to your goals! It is easy to get sidetracked with your ambitions and long term goals, but you need to focus on the short goals as well because these short goals will eventually get you to your long term goals. How did you get started with your baking business and what is it like to run it? I started baking in high school when I became obsessed with watching The Food Network. I am entirely self-taught which has been so fun because there are no rules! 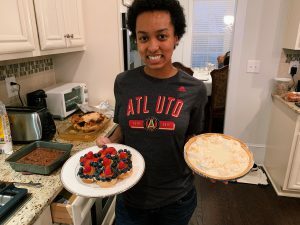 Once I started getting the hang of baking, I reached out to friends and family to see if they wanted me to bake for any parties or events and that is how my little home baking business got started! I made a website and business cards so I guess you could say I’m pretty official (haha). It is still very small but one day I hope to open my own bakery! Besides film, Huddleston’s other passion includes baking. Follow her bakery account on Instagram, @kalley_konfections. My dream job would be to write for an animated TV series or movie. I love cartoons and animation because there is absolutely no limit. If you want to have a character who has three heads and works at a McDonalds you can do that because cartoons don’t have to make sense! That is what makes cartoons so beautiful and fun. My favorite social media outlet is Twitter because people are actually funny and raw. On Instagram and Snapchat people try too hard to be perfect, but Twitter is where you can let it alllll out. If I have any “last words” I just want to let kids with learning disabilities know that ANYTHING IS POSSIBLE! Do not let anyone stop you including yourself. Just keep pushing you can do this!